You may have missed it in the madness of late 2018 but David OReilly’s 2014 summit-based masterpiece, Mountain got a major update in December. This update --Mountain 2.0 as it’s called-- refreshes a game that I already loved a gives us all an excuse to jump in for the first time or check out all of the changes. But what is Mountain? Well the naysayers would describe it as “watching a mountain spin around in space while things happen randomly” and fans would… well fans would probably agree. In Mountain you act as a sort of passive deity observing a mountain-shaped planetoid as it hurtles through space. With the exception of some end game events (no spoilers here!) there isn’t a lot you can do outside of controlling the camera and advancing text while the mountain waxes poetic. Oh yeah, the mountain is sentient. Occasionally random objects will smash into the side of your rock friend, but much like caring for a succulent or Tamagotchi, the real appeal of Mountain comes from passively spending time with this thing. I know that Mountain isn’t going to be for everyone, but I think it’s a game everyone should at least try out. My time with Mountain is almost never spent directly playing the game. As I’ve been writing this piece, my mountain has been quietly spinning around on my second monitor getting hit by traffic cones and desk fans all throughout. It’s nice to be in the presence of someone else (even if it’s a digital mountain) and periodically checking in with them to see what’s changed, especially if that change is a new hat in the form of a school bus. But why are we talking about this game now? With the 2.0 update, there are a bunch of new reasons to love the game. One of the most striking changes is that game looks like it could have come out in 2018 now. While there aren’t a ton of fancy effects involved in Mountain, the fact that you can have more than a sparse handful of trees on your mountain is a welcome change. Beyond visual upgrades, there are also tons of new bits of garbage that can slam into the surface of your mountain and I’m not sure you can even collect them all in one lifetime. Lastly, the most major update is the one I can say the least about. If you look to the bottom of the game’s 2.0 patch notes you’ll find the line “more secret modes to uncover and improved old ones” nestled in among midi controller support and slow-mo. At this point I’m not sure what all of these secrets entail, but the ones I’ve found range from cute to impressive. No I won’t spoil any of them for you. Mountain is a game that is vaguely like things you may have played before. 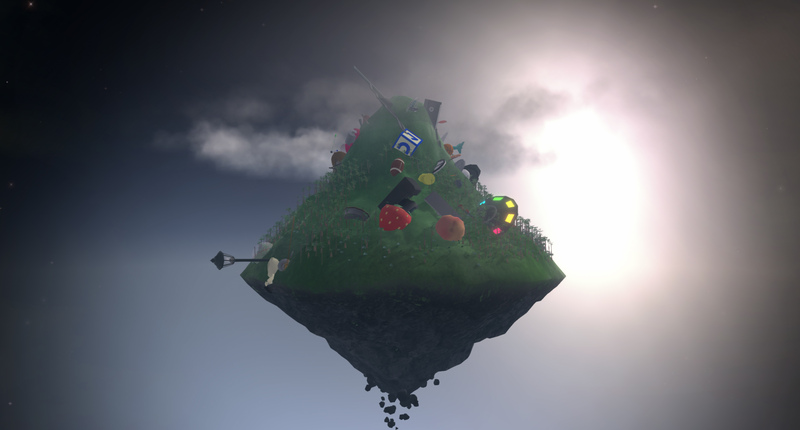 There’s weird garbage collection like Katamari and passive entertainment like an idle game, but Mountain is still a wholly unique experience almost half a decade later. If you haven’t gotten a chance to play Mountain, or if you are feeling inspired to go back, the game is only a dollar and is better than ever.